Did you know that 92 percent of consumers now read online reviews? Or that 84 percent of them trust such customer generated contents just as much as their friends? These numbers very well outline just how important of a role reviews and ratings come to play in the success of a business today. For online sellers, it is even more crucial. Amid stiff competition and when other vendors are, more or less, offering the same kind of products and executing similar strategies, there are only a handful of things that can make as much of a difference as customer reviews. Not only do such contents put forth the products and brands in the truest of form, which usually lacks in (poor) self-absorbed marketing efforts, they also build trust. And in the online scene, trust has emerged to be a defining line between the small and high earning sellers. So, if you’re an online merchant, getting customer reviews should be at the top of your priority list. But then again, getting words out of customers, and the good ones at that, is a challenge in itself. Additionally, tackling negative reviews is an art that is known not to many. But don’t worry, we have got you covered here. There are ways to get your customers go ‘head over heels’ when reviewing your products. The whole process can be divided into 4 parts. Now let’s break down these parts into multiple steps to understand things better. Guess who is offering good products? Your competitors! If you want to outdo them, it’s imperative that you offer great products. NO LESS! No amount of marketing and fawning can beat the quality. So, ensure whatever that you are offering is of A-Quality. Many online sellers are in bad habit exaggerating about their products on different channels and in different forms. They go over-the-top in product descriptions and use false claims in marketing efforts just to attract more purchasers. Don’t do this. Because upon getting their products, customers would see through your lies and embellishments. And if that happens, your retention sizes to ZERO. They might even leave bad words for you on different platforms. At such time, Online Reputation Management becomes extremely difficult. So, avoid creating contents that exaggerate about your offerings. Be as honest as possible. All the time. How would you react to a person talking to you very friendly? Unless you doubt him/her to be a serial killer, you would respond in an equally friendly manner. And in that conversation, you will see a bond forming that, if nourished properly, can go on to become much more meaningful. The same dynamics work even in the online scene. When you engage your audience or customer in a meaningful conversation, you can connect to them on a more intimate level. This can then easily shape in a good customer experience. And when the customer has enjoyed or is enjoying dealing with you, they would definitely love to leave you good product reviews. These are 4 steps that accrue enough reasons for the customers to leave good reviews and ratings for your products. Now to the next part of asking them to leave reviews. Include a note in the product package asking the customers to leave you an online review. When, after checking and trying the product, they see a request from you to leave good words for the product, they are more likely to act on that. Now the note, if you can, make it more personalized. Include the name of the buyer if possible. Also, along with that, include a QR code and shorten URL where the customers can conveniently go and rate and review the product. Who wouldn’t want to act on that sweet request?! Follow up the sale with a drip email campaign. Depending on the product you sold, you can tell customers more about its features and how they can maximize its usage. Ask them if they are facing any problem with their purchase. And then ask them to leave good review and rating on the product page. With the right email automation partner and copywriter, this is quite easy. Don’t just use social channels to talk all good about your products. Use it regularly to ask your existing customers to leave reviews and ratings. This is like a simple reminder. If you have offered them a good product, most of them wouldn’t mind rating you good. Also, don’t go “please review us” or “please rate us on Amazon”. Such requests usually go unnoticed. Try to be creative and keep the focus on the customers. Something like “Did you like our product? We would love to listen to you here (link to your product page)” would be much more effective. These are 3 simple steps to ask your customers to rate your products on marketplaces. Of course, even then, many of them wouldn’t care about doing that. In such case, you must WIN their reviews as something of a prized item. This is what the next part helps you do—win reviews of reluctant customers. This step might be a little bit intrusive and many people won’t like it, but it’s worth trying. You already have the number of the customers that you collected at the time of checkout. Pull up those numbers and shoot them a sweet text message on their phone. Ask them if they liked the product and remind them to ‘write about their experience’ on the following link. Given it’s a much more personalized form of communication, many would act on it. You can use blog articles to engage your purchasing customers and push them to leave their ratings and reviews. Here, you are required to be a tad creative. For example, say you sell athletic wears. Now, you can write an article on something like “How to improve the longevity of your fitness wears” or “10 tips to run and workout longer every day”. After giving them a resourceful read, at the end include a Call To Action (CTA), asking the customers to leave their reviews on the products they purchased. If you have offered them something worthy in the article, many would be much more positive towards your CTA, eventually leaving you good reviews. 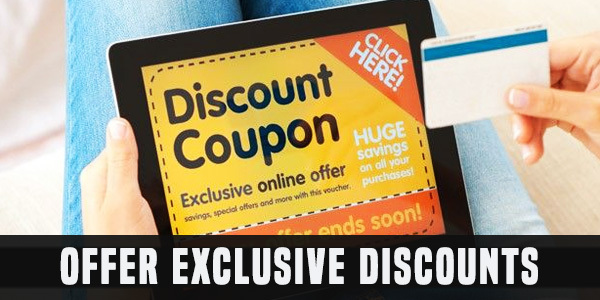 Ask your customers to review your products and then offer them exclusive discounts on their next purchase. This can not only increase the number of reviews but also effectively increase your sales. Admittedly, pulling such campaign on a mass level could be a tedious task. First, you must redefine your pricing strategy and keep your long-term profit margin intact. Also, you must efficiently communicate this offer to your customers, and on the right platforms. Moreover, you must have a proper mechanism to track the reviews and who are those individuals. Your customer database will only get bigger. But kept aside all the efforts you would have to make in this process, if you manage to pull all the strings correctly, the rewards could be beyond your expectations. Talking to your customers individually, asking them the right questions and resolving all their queries—these are sure shot ways of not just getting good reviews from them but also improving your retention rate. So, after email, the next best avenue for engaging your customers is social media platforms. Converse them on the likes of Twitter, Facebook, and Instagram, DM them, strike a meaningful conversation. And at the end, ask them to share their experience about the conversation and the product in the review section. Cash backs are a new breed of offer in the online shopping world. And it must be your last resort. So, before that, you must do your calculation correctly. How much cashback do you want to offer your customers for leaving good product reviews? How much benefit will that particular review bring to your business? How you’re going to track such reviews, customers, and cash back? How are you going to communicate this offer to the buyers in the most impactful way? These are few questions that you must answer before going ahead with the cashback offer. Again, this task could end-up becoming a big stress for you. So, ensure you have enough resource to handle the workload and that the return is worth the effort. These are 5 steps that would help you WIN the reviews of your customers. If done correctly, in no time, will you have a pool of buyers going head over heels for your products in the review section. After that, comes the next big challenge—negative reviews and how to deal with them. This is what we discuss in the next part. Good or bad, respond to every kind of review promptly. But when dealing with the negative ones, understand the difference between promptly and hastily. When you act in haste, there’s a big room for making mistakes. But when you are prompt, you think first and then respond. So, whenever you spot a negative review, however cruel, take a deep breath, control your emotions, think from the perspective of that customer, think of the most appropriate way of responding and then hit the reply button. The quicker you reply, the better it is. Because you never know how many customers can form a perception of your product through this negative review. Now here’s prickle though—at least for multi-channel vendors. When selling on various platforms, keeping a tab of all pouring reviews can be difficult. Responding them can be even more hectic. This is where a good e-commerce solution can come to save your life. Names like ChannelSale, a globally trusted multi-channel e-commerce software solution, can integrate all your shopping channels and make handling the various ends of your stores much easier and quicker. So, on their centralized platform, among other things (like inventory, listing and shipment), you can easily track your reviews on different storefronts and then respond to them promptly. Never (ever) argue with the customers. Never call them a liar or question their experience. Regardless how tempted you are to go against their words, always act empathetically. Listen to them. Nod. Agree with what they are saying. And then provide the right course of action or solution. When you question them, you will only make the matter worse. And the conversation there may even trigger other customers who may end up reviewing you bad. These days, it’s not uncommon to find businesses running smear campaigns against their competition. Often you, too, can fall for such campaign by your competitors. So, it’s important to identify such negative reviews from the unauthentic resources, which could be tricky. Do a background check on the customer who left the bad review with whatever information you have at hand. Ask them for their invoice number to identify them or any other reference number you have provided them. If they haven’t purchased from you and are lying in the review, even then don’t go all guns blazing at them. Just stay calm, use humor and deal with them in a good way. Many online sellers do this thing—instead of admitting their mistakes and the flaw in their products, they try to give some lame excuses. And unless the customer is really dumb, nobody buys such reasons. So, whenever you find that it was your mistake and the product wasn’t the best, the go-to option is to accept it, then apologize for it, and then promise to improve. A positive response to negative reviews can win hearts. You will often find customers who will be angrier than they should. They are hard to deal with. And they would completely shame your brand and products. Again, yes, they might be over-reacting, but it was your mistake for providing them a bad product, right? So, at such times, it is best that you compensate for the troubles they are going through. Now you can decide to return back their money, replace the product for free or offer them some freebie as a gesture of sorry. Such measures can easily calm them down and reassure the other people who are reading the review that you’re a good seller. These are 5 steps to effectively deal with negative reviews. Admittedly, the mentioned steps in individual parts can take a lot of time and resource. So you must find the right and most efficient ways to execute them, which is a topic for another discussion. To make things quicker, you can signup to social media management tools and multi-channel e-commerce solution. All being said, these are the steps how to get your customers go head-over-heels when reviewing your products. Now go, do it! This entry was posted in online sellers, Product Reviews and tagged get product reviews, online reviews, online sellers on July 14, 2018 by admin.